She is a teenager and in high school. Like every other teenager, her craving for fast foods and chocolate was immense. She never exercised or had any kind of physical activity. She sat at home all day when not in school. As a result of being inactive and eating junk food she weighed on the higher side and was marginally obese. At that young age she was advised, if she did not take care of herself, she could develop lots of health issues as she grows older. Immediately, she decided to correct her mistakes and get on the path to fitness and a healthy lifestyle. You will be amazed at her change. 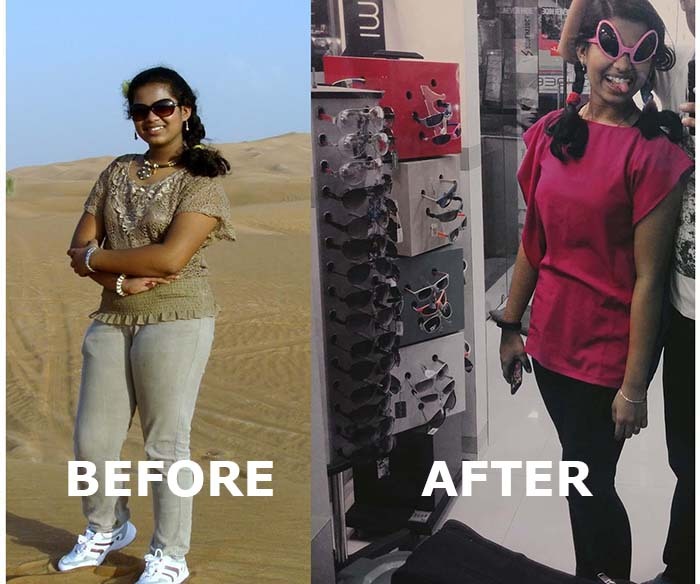 Let us hear from Lavanya Nagesh how she managed to get fit and healthy? I’m still in school and until one year ago I was very inactive. Over the years, all I did was gain weight and was diagnosed with PCOD. I weighed on the higher side and was marginally obese. At this point in time, I was advised by the doctor to lose weight. As we wondered what I should be doing and how to rectify my health? My brother told me about GOQii and how it works. My brother motivates me to do a lot of things and my getting on the fitness path is also because he got me on it. I got a band for myself. I was then given a personal coach. My coach is Rashina Nuzhat and she had a detailed chat with on my lifestyle and all that I do all day. She then suggested that we make a change and take each aspect one by one. My coach first asked me about my daily routine and the kind of lifestyle I lead, what I eat, when I sleep etc. 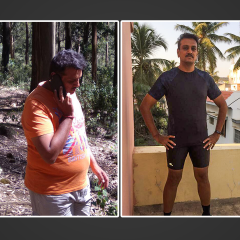 I was truthful about the fact that I had no physical activity whatsoever after I moved to Kolkata from Pune. Till the time I was in Pune, I used to play for a while in the evening. 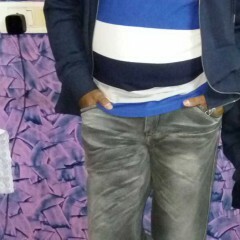 In Kolkata, all I did was hang around the house doing nothing. To add to it, I ate a lot of junk food. When I got on board GOQii my health goal was to lose weight. After hearing me out, my coach decided to take one step at a time with me. We started slowly and moved ahead. My coach started me initially with short walks and after two months I was alternating between cycling and walks. Alongside my physical activities, my coach also regularised by diet to a healthy diet and slowly got me off junk food. I used to eat lots of burgers with cheese that’s my favourite, and I used to eat a lot of sugar coated sweets. The entire process of change was fun and enjoyable. When I say fun, I meant that I enjoyed working out and giving up junk food. I started liking healthy food. My coach motivated me at every step. She would send me interesting articles on health, fitness, nutrition, the foods I should be eating etc., which I enjoy reading. I would read and also ask her some stupid questions which she would diligently answer. My coach would have an answer for all the questions I would ask her. While I more often than not eat healthy food, once in a while I do have my cheat days. When I tell my coach about eating or having eaten junk food, she says you are allowed to eat but, moderation is the key. I do not have chocolates as much. I have reached a state where I do not like sugar. Thanks to my coach, I have got into the habit of eating healthy food. I make my own salad based on the recipes suggested by my coach. I take proteins and my coach also suggested foods that will help me shift from my junky side to a healthy life. My cravings for junk food has considerably reduced. I am conscious of what I eat. On the exercise front, I do cardio for about one hour every day and I combine this with strength training. I also alternate my walking with cycling. I am enjoying every bit of exercising as it’s become part of my daily routine. Also knowing I am getting healthier and fitter keeps me even more motivated to get ahead. 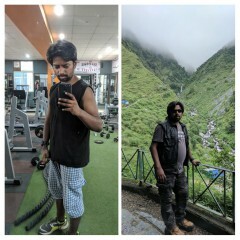 Today, it’s been over 6 months and I have lost around 8 kilos purely through exercise and nutrition. My biggest realisation has been that you do not put all that weight overnight and you will not lose it overnight. You have to work hard. Prior to GOQii, I weighed 74 kg, now I am at 65 kgs. Moreover, my PCOD issue has also got solved. 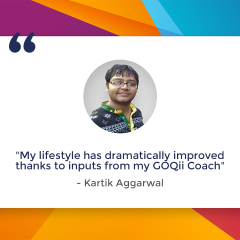 What GOQii has done specifically for me is that it has motivated me to take the fitness path to a healthy life. When you know you are accountable to someone you get more serious. I am accountable to my coach who has been motivating me and has helped me get so far. Today, I am not the only one who is feeling the change but, people around me, my family and friends are also noticing the change in me. I am still discovering the new ‘Me’, I am an entirely different person I had never met before. I am getting lots of compliments. I am feeling good as I feel lighter, healthier and looking nice. All my friends are asking me what I have been doing and asking me for suggestions. And I tell them GOQii and my coach have helped me. What does Coach Rashina Nuzhat have to say about Player Lavanya Nagesh? Lavanya is a 16 years old teenager who is really conscious about her body image. But, like every other teenager, she has a weakness for junk foods and chocolates. Initially, I started with her goal of weight loss. We began with walks and cycling. She is so enthusiastic about her exercise that she has now slowly progressed to running, doing crunches, pushups, planks and weight training. Once the exercise regime was in place and Lavanya got regular with her physical activity, we focused on nutrition. I asked her to control her urge for junk foods. I advised her moderation was key. She has also started her intake of fruits and nuts which were missing earlier. After these changes once she started losing weight she became more conscious about her diet and exercise that led her to eventually realise the bad effects of having junk foods and eventually stopped having it. She has been diligently following my advice and that is reflecting in her health. The change is also being noticed by her friends and family.